I was looking at a past bulletin with this image. What I'm curious about is what's different about the bright spots that are the objects of interest in comparison to all of the other bright spots on the reef? I assume there's more to see in the original vs. the online image. I did do a forum search but didn't find any discussion specific to that image. My apologies to Marty if my search was not thorough enough. I really did try. The thing that's different is that the objects of interest occur in two separate photos. All the other bright spots are dust particles or flaws in the photos. The objects of interest are real things and one of them is exhibiting what's called a "specular reflection" that you only get from metal. You da man, John! Keep up the good work with searching and reading and questioning. Well done! I don't think I've seen a direct answer to your particular question in the Forum before. 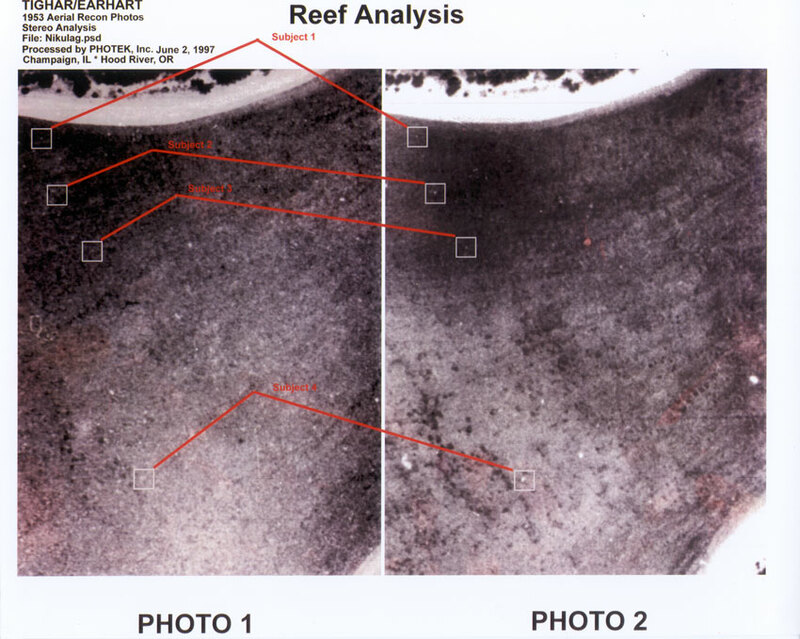 The four objects on the reef are mentioned in "Corroboration," a short article in the September 1997 issue of TIGHAR Tracks. I hate to start another camels in the clouds thing, but I'd like to know what the shiny object is on the coast of Niku. The first picture is the enlarged google earth view, the second picture shows some context. I wondered if it might be part of a more recent wreck of some kind? Or is it something left over from the british evacuation back when? Or a shadow and my imagination? Thoughts? but I'd like to know what the shiny object is on the coast of Niku. The first picture is the enlarged google earth view, the second picture shows some context. I wondered if it might be part of a more recent wreck of some kind? Or is it something left over from the british evacuation back when? Or a shadow and my imagination? Thoughts? I don't see a shiny object. No, I guess I won't. highlighted area with two bush/tree items on right for reference. Note that there are shadows made from parts of what ever appear to possibly be visible perhaps. It may be necessary to have another person look at it to point out the features. I've drawn a sophisticated yellow box around the area in question. Please no smart remarks. I've drawn a sophisticated yellow box around the area in question. Please no smart remarks. Not trying to be a smart-aleck, but I just don't see any yellow boxes in the picture at all. I see the yellow box drawn with hi-liter, but I see nothing of interest in the box. That area is just a short way up the beach from the landing channel. We walked past there every day. This is what it looks like. OK. That was the clue I needed. I was looking for a different kind of yellow box. My monitor must not be calibrated correctly. Took me a while, but now I see it. I believe what you are looking at is a depression in the coral that happens to have the odd aircraft shaped look to it. It can look like the inverse, where it seems to be an object, but is actually a void. If you notice, there are a bunch of shadows visible - the dark spots all on the south east side of several corners which happen to be in line with the shadows from the trees. In the end, I don't think that what you see, or think you see, is there. It is coral formations and the gaps between them. Thank you for looking at the picture, Andrew. I see the shadows you reference, but do not understand, exactly, why that would result from a depression in the coral. However, its not important I understand it. I haven't seen coral with such crisp indentations, but I don't dive as you do. I never intended that it was anything to do with AE of course, it just concerned me that it might be something from somewhere else that was of interest to someone. I asked NTSB analysts to look at it so I can stop thinking about it. Someday, when they come back to work they might do that, but there is nothing else for me. I do wonder about the white dot to the left of the object that suggests something sticking out and/or reflecting. It too has a slight shadow. but enough. I'm glad the yellow box re-appeared too.